Los Angeles, June 7, 2017... Linda Mackenzie has agreed to conduct an exclusive, Expand Your Psychic Ability Workshop through the well-respected Omega Institute in upstate New York in July. 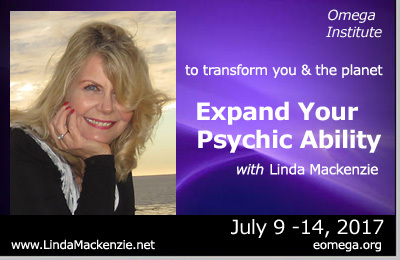 This multi-day event is truly unique as it lets attendees examine and experience 17 distinctly different psychic abilities under Mackenzie's skilled guidance. "Since ancient times psychic abilities have been known and respected," Mackenzie explains. "Today confusing and often untruthful ideas surround these abilities. It's time for people to understand that we all have psychic ability which we can purposefully use." concept of 17 different psychic abilities. She is a former data-com engineer for major airlines and Fortune 1000 companies. In the world of entertainment, she is a multi-time published author, radio host and high-profile figure in electronic media with the 15-year profitable and successful HealthyLife.net Radio Network. She has appeared in several award-winning documentaries, and almost all network and cable TV stations, including Discovery, BBC and the History Channel. And, throughout the metaphysical world and recent decades, Mackenzie is one of the world's most profound and beloved psychics with a weighty clientele list including political figures, celebrities and corporate executives. Her website is www.lindamackenzie.net. "Learning about and actually utilizing psychic abilities, is a different journey for each individual." states Mackenzie. "so I present the ethics, historical data and carefully crafted, hands-on psychic awakening experiences that all together help enhance the individual abilities of my attendees; allowing them to become more highly developed, positive forces to in turn, help transform the world for the better." Omega Institute: At the forefront of the human development movement since 1977, Omega gleans 23,000+ visitors from around the globe to attend their workshops, retreats and conferences. Omega's Hudson Valley lakeside 250 acre campus includes: the Sanctuary, Ram Dass Library and the Omega Center for Sustainable Living.